I was about to give this post a different title: 7 Reasons for You to Use Workbooks … . But I have to be honest. I’ve never completed the written exercises in a workbook or followed through on all the recommended daily practices. Sure, I’ve read several and have found a lot of interesting ideas in them. But really work with one as its author intended? No. It’s time to change that by starting an experiment in self-guided therapy. I’ll pick one example of each of the major types of workbooks, finish it and report back with a review. But I’m suspicious of my own thinking when the end result is avoiding a method that could help prevent relapse, that is, avoiding the discipline of mastering new skills. Here’s what I usually tell myself – or assume – about workbook practice. I have a different style of learning: I’m strongly intuitive – big picture not step by step. It’s so obvious, I already know all this. It’s juvenile – I haven’t had a workbook since 3rd grade. It tells me to do dozens of activities that I can’t do when I’m depressed and have no energy or motivation. There’s a mass of little do’s and don’t’s that I can’t possibly keep in mind. The examples don’t have anything to do with my experience. I hate filling in the blanks, especially when I know what the answers are. This is what my resistance to learning new skills often sounds like. In terms of depressive thinking, it’s uncomfortably close to: What’s the point? Nothing ever helps, I can’t do it right. Why try? And so on. Maybe I’m exaggerating, but I’ve stayed healthy for the last few years by being alert for the earliest signs of relapse. That’s why I’ve tried to turn this thinking around and look for reasons to do the work instead of dismissing it out of hand. Hence the seven reasons. There are surely more, but these were enough to start me on my experiment in workbook learning. Workbooks encourage you to start doing things. Any form of self-help action begins the slow process of ending the paralysis of depression. They make it easy to get going by emphasizing small steps, one at a time, and working at your own pace to move to the next one, and the next. 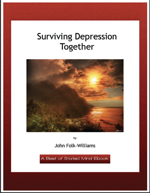 By breaking out the various symptoms of depression and giving you tools to deal with each one, they counteract the belief that you can’t possibly make headway against the power of such an overwhelming force. A good workbook gives you a straightforward way of imagining and organizing the entire course of recovery. This helps you place each practice into a bigger picture of where you’re going. They guide you in preparing written materials and reference points that you can refer to when you are slipping back into depression and losing touch with the skills you’ve been learning. They help you set realistic goals for change and constantly remind you how to measure progress by focusing on what you do accomplish, instead of what you do not accomplish. They build and reinforce the belief that you can be an active participant in your own treatment. By explaining the many forms of therapy and options for getting support, they guide you step by step in making choices to meet your needs. That stance toward treatment, the attitude of taking charge, has been a cornerstone of my own recovery. A good workbook helps you break depressive habits by replacing them with positive ones, but doesn’t stop there. It helps you relearn life skills that focus on sustaining well-being, not just ending illness. These are the reasons that cause me to take a fresh look at the value of workbooks. The next question is which one to start with. Workbooks use different approaches, and you should look at several to find one that seems congenial. That’s the one you’re most likely to stick with. Some introduce a specific form of therapy, like mindfulness meditation (A Mindfulness-Based Stress Reduction Workbook ), or ACT – Action and Commitment Therapy (Get Out of Your Mind and Into Your Life ). Some present an eclectic plan of action, a useful way of thinking about a journey to recovery (Your Depression Map ). Some are compendiums, listing dozens of techniques for you to try (The Anxiety & Phobia Workbook ). Some are part workbook, part detailed presentation and part reference for a method that can be applied in many contexts. They devote most of their space to explanatory text with brief self-assessment exercises you can complete in the book itself (The Feeling Good Handbook ). Others do the opposite and emphasize your input to the exercises that comprise your plan of action (The Depression Workbook ). She’s writing from personal experience of having lived with depression for years. After enduring many ineffective treatments, she gradually developed an approach that worked for her. That experience became a starting point for her workbooks. She added to her methods by studying the experience of 120 people living with mood disorders. She has given successful workshops to thousands of people with mood disorders for the past 20 years and has revised her methods in response to what she has learned from workshop participants. She’s written many other workbooks and seen this one into a second edition. The workbook puts the emphasis on well-being, not just recovery from illness. Her approach emphasizes the importance of taking charge of your own recovery. That means more than helping yourself by following healthful living habits. It means making informed choices about your treatment and accepting responsibility for your wellness. She has found that those who approach recovery in this way enjoy more success and stability as well as greater satisfaction in life as a whole. That’s enough for me to choose this workbook to begin my experiment. I’ll post a review as soon as I’ve finished it. In the meantime, let us know if you’ve found workbooks a helpful part of your treatment. Are there any you can recommend? Neurotic depression is a feeling of sadness & regrets to real identity issues in a depressed individual. It is connected with an absence of certainty, confidence & with failure to express depressed feelings. Learn how to deal with neurotic depression? I am look for help with so much .that i like what you said. I’ve always hated workbooks. I think my reason is because I had cognitive difficulties during the time it was suggested that I “do” a workbook. We would all sit in a room, write our answers and then share them. That was another drawback. Knowing I was going to have to share what I had written down. Major anxiety! I hate workbooks when I do a Bible Study at church, too. And even though we don’t share our answers, it seems like meanigless grunt work. I’ve been really disappointed when I ordered recovery-related books online and they happened to be workbook-based. I look forward to reading your experience with this particular book. If it is worthwhile (and one that emphasizes wellness just might be) I may try it myself. Was that group therapy with a workbook – or a different sort of group? I can’t imagine doing a workbook and sharing the answers in a therapy setting. The ones I’m working with are all about developing a treatment plan that is all yours – responsive to your particular symptoms and needs. No wonder you hate workbooks! I’m trying to disengage from whatever experience or ideas I’ve had about them in the past and do them non-judgmentally. Suspending judgment is the hardest part. It was a 12-step depression recovery group, based on religious tenets. I was not interested in anything having to do with religion at the time. My mother just insisted that this was “just the thing” for me and I went along. She still thinks this particular group (Rapha) is what “cured” me of depression…despite the fact I have ongoing problems with depression and its aftermath. To protest, I just sat there and never even picked up my pencil. I told them I was too sick to organize my thoughts on paper. A smattering of Bible verses does not necessarily make for good therapy. What a clash of perceptions between you and your mother. I guess we can see what we want to and ignore any evidence that goes against what we need to believe. Makes me think of my own belief that I couldn’t be successful, and anything good I did was dumb luck – or not as good as others mistakenly thought. No one could convince me otherwise.